Watch this space to find out about the super sporting achievements of children throughout the school. If you or your child has anything they would like to share following a sporting event or success, please contact Mrs Oliver-Hawkins. This time, Luke made his way to the British Tae Kwon Do championships. Luke fought incredibly well and managed to beat back nearly sixty competitors to achieve fourth place. Well done Luke! Congratulations to Lilly Rea in Year 4 for achieving her Level 5 trampolining and her Level 3 gymnastics. What a great achievement. I look forward to hearing about your next steps Lilly! Tae Kwon Do expert... achieving again! Massive congratulations to Luke Smith for gaining his 3rd Kut Blue Belt grading certification in Tae Kwon Du. Another great achievement, well done Luke, keep it up! Dion Davis is an exciting young gymnast. His passion and enjoyment for the sport has been apparent for years. Last weekend he represented Andover at Milton Keynes in a regional competition in tumbling. We are so proud of Dion as he won the Gold medal! We cannot wait to follow your progress Dion! Luke Smith is a passionate Tae Kwon-Do enthusiast. He has represented Great Britain in the world championships, and he is only 8 years old! He has recently achieved his 4th Kut Blue Belt, as well as completing in an ever growing amount of competitions. Well done Luke - keep it up! Congratulations to Chloe Hillier on achieving her Level 2 swimming. Keep up the good work Chloe! Nathan Down has a passion for BMXing! He continues to develop his skill, showing nerves of steel. This photo demonstrates Nathan in all his glory. Well done Nathan - we can't wait to see what you will do next. There have been yet more dance successes in Key Stage 2. Congratulations to Mia Blackmore and Evie Mitchell. Both girls achieving distinction in ballet and dance. Please remember to come and see me with your sporting achievements. Huge Congratualtions to Evelyn Morse on her recent Ballet and Tap examination. On Thursday 23rd March, a group of year 5/6 girls travelled straight from school to John Hanson to compete in a Netball Tournament. Even though the girls had worked very hard all day, they still played with bundles of energy and enthusiasm, passing quickly and scoring a number of goals! The girls played in a number of games. For each match, the tam rotated positions, showing off their sportsmanship as well as talent. The team played extremely well and did fantastically to earn themselves 6th place out of ten teams! A huge congratulations to Evie, Luana, Faith, Ashleigh, Josie, Hannah and Lucy. On Thursday 2nd March, a group of children from years 3 and 4 travelled to John Hanson School to take part in Lion's in the Community's football festival. The day involved a number of games throughout the morning and the afternoon, before the deciding matches were played. Our players played spectacularly, with some amazing passing, shooting and teamwork. It was wonderful to watch the children play as a team, always encourgaing each other and congratulating them on their best efforts. Every single player played very well, showing off a tremendous amount of skill, which lead us to a very tense game. After a number of goals, Clatford not only walked away with a very proud 4th place, but also with the referee's Fair Play award. The children should all be very proud of themselves! An enormous congratulations to Nathan, Harry, James, Mia, Henry M, Fraser, Finn and Henry C and Charlie. Congratulations to Noah in Year 2 who has been awarded a medal from his football coach for outstanding play! He has shown excellence sportsmanship and skills during training session and is very proud of this achievement. We are very proud of you Noah, keep it up! We are also very proud of Harry in Year 3 who was awarded 'Man of The Match' in his football game against Tadley FC. Harry's impressive skills helped him score 2 impressive goals, resulting in a win for Andover Town Youth. Well done Harry! Congratulations to Shannon in Year 5 who has recently earned an impressive collection of dancing certificates! The 4 awards recognise her talent in tap, ballet, freestyle and performance. Her achievements have earned her two very shiny medals which she should be very proud of! Violet, Beatrix and Anna have all been awarded certificate for their learning in gymnastics! The girls had to perform a set of advanced skills on the trampoline and floor to be able to proudly achieve their level 3,4 and 5 certificates. Congratulations girls! Fraser and Henry M in Year 4 have done an amazing job at representing Andover Athletics Club recently. The boys both ran in a cross country race, completing a course of over 2km. Fraser finished 2nd for Andover, closely followed by Henry in third. Watch this space for more news on the boys' future races! A huge well done to both of them! Joanna in Year 6 has been awarded with a wonderfully shiny trophy for her incredible Street Dancing ability. She was chosen out of all of her children in her class for her impressive performance of her routine. Well done Joanna! Thomas and Andrei are proud members of A K Andover Football club. The boys have recently taken part in a tournament and played their way to be crowned runners up of the tournament. Both boys have been awarded with a very professional medal each to remind them of their fantastic effort and achievement. Well done Tom and Andrei! Clatford School is home to a number of incredible ballet dancers! We have been amazed with so many certificates and awards to commend our fantastic and dedicated dancers. Sophie, Amber and Francesca in Year 6 have recently received some brilliant awards, as well as Bea, Hannah, Daisy, Ellie and Scarlett-Mae in Year 3. Keep up the super work girls! Sam in Year 4 has been extremely busy outside of school and has bought in a very impressive collection of medals, trophies and rosettes for his achievements! He is a very talented sportsman and has been awarded a trophy for his rugby in a recent tournament, a rosette for beating his personal best at pony club, as well as just losing out to first place in a cricket tournament. What an all rounder, well done Sam! Some of our KS1 children have been learning and developing their sporting ability at our Multi Sports Club which takes place after school on a Monday. The club teaches the children skills and techniques used in a range of different sports from football to basketball to hockey! Congratulations and keep up the fantastic effort! 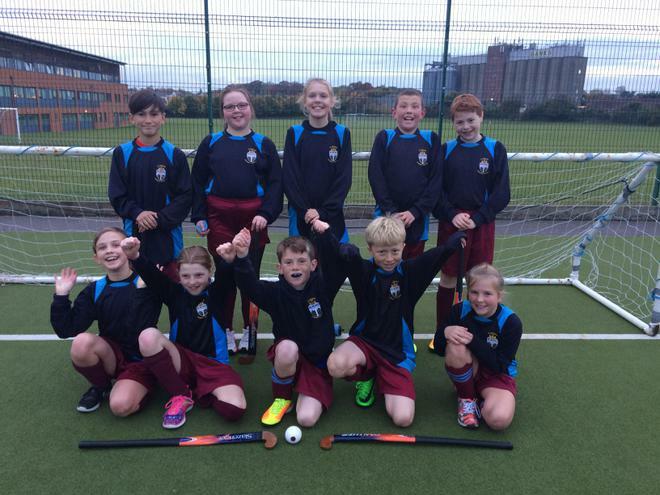 On Thursday 3rd of November, ten children from Year 5 and 6 travelled to John Hanson School to take part in a hockey tournament. The children played some incredible hockey using their skills they learnt during their training sessions, showed excellent teamwork and attitude. After several matches, lots of swapping on and off and a tremendous effort by all, we drew joint with 2 other schools! Congratulations to Ashleigh, Tom H, Tom Y, Lucy, Charlie, Josie, Harry C, Harry D, Jessica and Luana for their excellent participation. You should all be very proud of yourselves- we are very proud of you!